This quote may be equally applicable to the interior design of buildings as it is the exterior, according to FSB Principal John Osborne, who for 15 years directed the firm’s design department, and now oversees its corporate market sector. In the past decade, business owners have witnessed work environments change significantly to become central to employee contentment and productivity. Interior environments impact our state of mind, level of performance and even our health. Now more than ever, the office environment is a major factor influencing employee recruitment and retention. In an effort to recruit and engage employees, business owners are placing new emphasis on autonomy and flexibility. Recent office interior design trends reflect this philosophy. Mobile working and desk sharing can help reduce required leasable areas and have become a great solution for accommodating remote team members for short periods of time. Corporate clients are asking for renovations or new spaces that provide employees more options in response to the increasing value many workers place on work-life balance. Many offices need teleconferencing capabilities and wireless connectivity. Nearly all need team spaces varying in size and formality. Open spaces and shared work environments create a synergistic, collaborative environment that enclosed offices simply don’t provide. As a result of differing traditions and expectations, Baby Boomers, Gen X, Gen Y and Gen Z employees each tend to prioritize workplace needs differently. Interior spaces must not only be flexible enough to accommodate generational preferences and varying work styles, but also to enable change within the organization including new technology, a rapidly growing staff, or churn. Other more qualitative trends center around light and color. More offices are prioritizing natural light, which has been connected with better sleep cycles and less absenteeism. Some are paying more consideration to color, which can affect mood and productivity. For example, green can be calming and reduce eye strain, helpful for people who work long hours. FSB typically begins every design project by developing an understanding of project goals, budget constraints and functional criteria to be incorporated into a design solution. Participating in charrettes or programming workshops is one efficient technique for accomplishing this understanding. These workshops are usually multiple-day sessions wherein FSB’s designers interface with client stakeholders to identify project design goals and requirements. This helps each team member on a project to develop an understanding of the design direction, priorities and values, and contribute throughout the process. 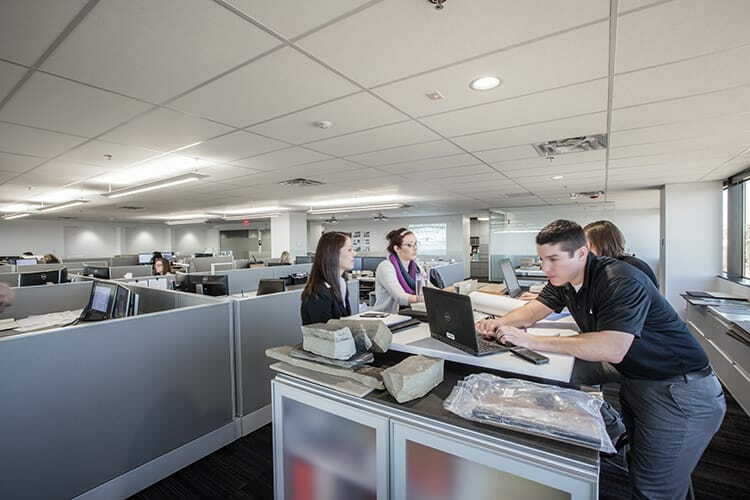 Because FSB is a full-service, multi-discipline architecture and engineering firm, the company’s approach is holistic—early collaboration between engineers, architects and designers allows for a cohesive design solution. Interior designers work alongside architectural designers and engineers throughout the project from pre-design through completion. 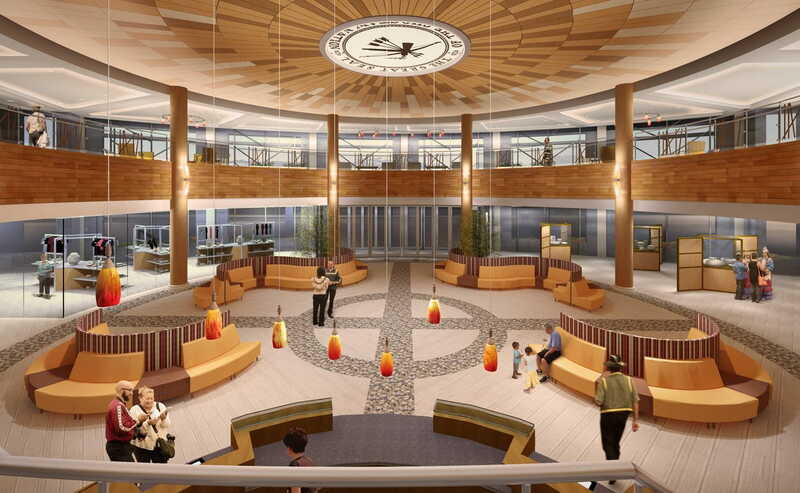 It took this brand of true cross-discipline coordination to deliver a cohesive headquarters building to the Choctaw Nation. FSB’s project team needed to create a space that celebrated the tribe’s heritage and respect for nature throughout the campus, including interiors. The interior designers on the larger project team had also planned a modern, flexible work environment for staff catering to diverse generations and workstyles. Lastly, the design would need to be durable, low maintenance and sustainable, a priority motivated by the tribe’s environmental and financial stewardship goals. The Choctaws had the opportunity to review color boards, material samples and 3D renderings in order to better envision the final product. They also accompanied the design team to several office furniture manufacturers’ headquarters to learn more about trends as well as to see first-hand the available options. The resulting interior was an extension of the exterior architectural design concept—a modern expression of the tribe’s long-held values and beliefs, incorporating the trend for flexible, open workspaces. “Class A” office space, defined in real estate as space with modern finishes, onsite restaurants or cafes, fitness centers and covered parking, is in high demand. Caliber Development, a real estate investment company, understood this demand and enlisted FSB to renovate their recently purchased office building in Oklahoma City. To bring more warmth to the space, the team created contrast with black granite flooring and a warm wood panel system. Stone was incorporated into the atrium area to bring more warmth and texture and carried through into the newly created café for a richer, more welcoming aesthetic. 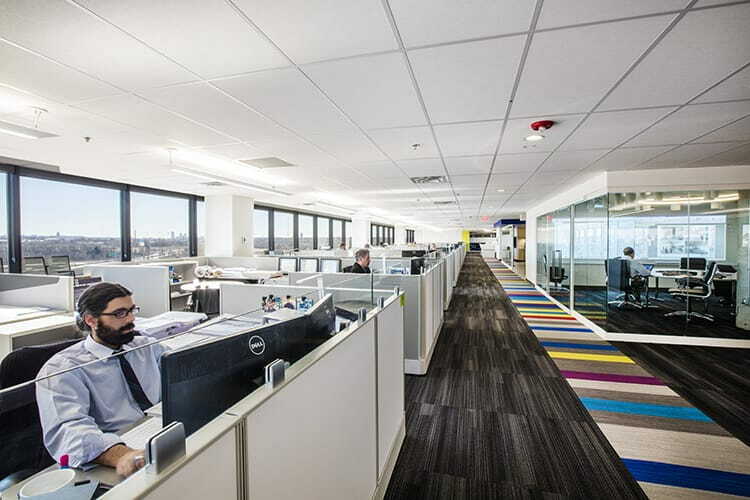 Osborne said once the renovation was complete, the building quickly reached 100 percent occupancy, and just four years later, Caliber sold the building for a significant profit, demonstrating the impact interior design can have on a client’s profitability and occupancy. The renovated office building now houses IBC Bank’s Oklahoma headquarters. Interested in learning more about corporate interior design trends and how FSB can help you on your next project, contact John Osborne, AIA, LEED AP at corporate@fsb-ae.com or call him direct at 405.840.2931.